I have a refurbished 27ʺ iMac. I tried to install Adobe Creative Cloud on it and I got the error code that it could not be installed on a case-sensitive drive. So I backed everything up using Time Machine and an external hard drive and formated the drive to Mac OS Extended (Journaled). But when I restored using Time Machine it went back to Mac OS Extended (case-sensitive, Journaled). How do I make this computer non-case-sensitive? You are not the only person to encounter this, but how frustrating when you weren’t the one who caused the problem. Case sensitivity is an option in formatting, because Unix and Unix-similar operating systems always allowed case sensitivity. That is, they could distinguish between files that were “spelled” identically, but used a different mix of upper-case and lower-case letters. In case-sensitive filesystems, file.txt, FILE.TXT, and File.txt are all unique names. Apple’s pre-Unix OSes didn’t have this distinction, and in a modern operating system, there’s no per-se advantage to sensitivity or lack thereof. 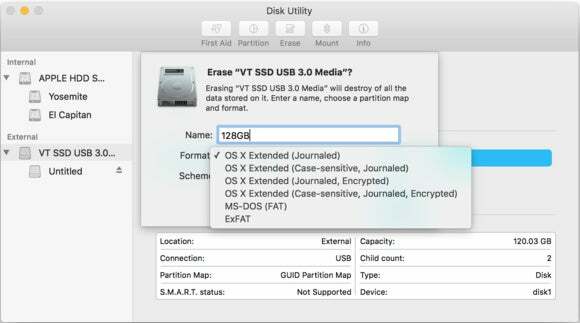 It’s included in Apple’s Disk Utility formatting options for backwards compatibility and special purposes. Unfortunately, based on your and other reports, Time Machine will not let you format and restore and retain the new case-insensitive setting. You’ll need to use a third-party drive cloning product. I checked in with Dave Nanian of Shirt Pocket, makers of SuperDuper, as folks report at various points on the Internet different success on cloning a drive, wiping it with the new case-insensitive format, and restoring it form the clone. While SuperDuper does a number of tasks for free, you need to pay for the premium version ($28) to make this work. 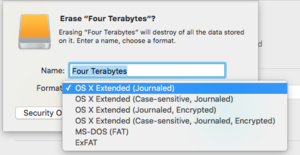 Disk Utility lets you pick among several formatting options, but only the default (shown as selected) is reliable for use with all Mac apps. The Smart Update feature supported in the paid version copies just the differences between a source and a destination. (Those can be drives, partitions, and disk images.) In a plain clone, the format is copied; with smart update, just the files are. Make amply sure that you have a really solid backup—maybe even two—before you erase a volume that you’re going to then restore! And if you happen to have two files named the same when case is ignored, one of them will be deleted, as SuperDuper warns you, before the smart copy initiates.